Ideal pairs but where have the right handers gone? Crowned European champions in the Russian city of Ekaterinburg in 2005 but in the opening round of the Men’s Doubles event at the Seamaster 2017 ITTF World Tour Platinum Lion Open in Tokyo on Thursday 14th June, it was defeat for the combination of Austria’s Stefan Fegerl and Portugal’s João Monteiro. However, the defeat was no disgrace whatsoever, they were beaten by the pair that surely forms the most ideal of ideal partnerships, the 2009 World champions and second seeds in Tokyo, China’s Ma Long and Xu Xin. The Europeans experienced defeat in four games (7-11, 11-5, 11-6, 11-8). The left handed pen-hold grip skills of Xu Xin, combined with the right handed devastating abilities of Ma Long is a quite daunting formula. Seemingly it by far and away the preferred combination; although Xu Xin and Wong Chun Ting are the only pen-holders on view in the first round of the Men’s Doubles event in Tokyo, the left and right handed combination is most certain the favoured choice of the coaches. Only one of the 16 partnerships was not formed by a right and left hander. The odd pair out was Belgium’s Robin Devos and Cédric Nuytinck, the no.3 seeds and they are both left handers! There was no partnership of two right handers! Furthermore, Robin Devos and Cédric Nuytinck, experienced defeat; they were beaten by Korea’s Kim Minseok and Lim Jonghoon (8-11, 11-4, 11-1, 6-11, 11-8). According to seeding it was a surprise win for Kim Minseok and Lim Jonghoon; likewise it was a surprise defeat for their colleagues Jang Woojin and Park Ganghyeon, the no.8 seeds. They were beaten by China’s Fan Zhendong and Lin Gaoyuan but I would suggest that result was no surprise at all; two months ago in Wuxi, Fan Zhendong and Lin Gaoyuan won the Men’s Doubles title at the Seamaster 2017 ITTF Asian Championships. Two arguable surprise outcomes but not where the other leading pairs were concerned. 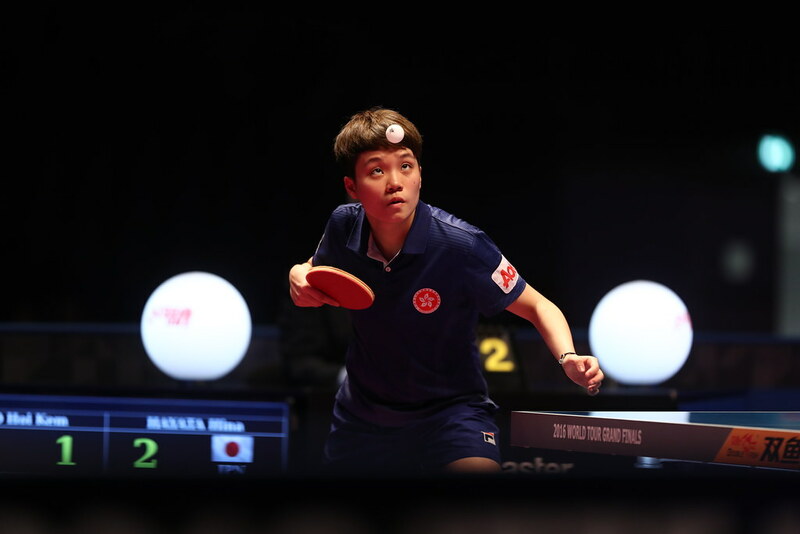 Japan’s Masataka Morizono and Yuya Oshima, the top seeds, beat Portugal’s Tiago Apolonia and João Geraldo (13-11, 11-9, 11-7), Hong Kong’s Ho Kwan Kit and Wong Chun Ting, the no.4 seeds, halted the aspirations of Tomokazu Harimoto and Yuto Kizukuri, like Masataka Morizono and Yuya Oshima from Japan. The Hong Kong duo won in three straight games (11-6, 11-9, 11-6). The quarter-final stage of the Men’s Doubles event will be played on Friday 16th June.